After reintroducing the 800mm f5.6 as an AF model while also replacing the tried-and-tested ED glass with fluorite elements to reduce weight, it was really only a matter of time before Nikon would update the other super-telephotos in the lineup. 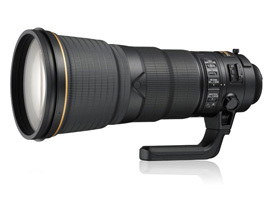 Nikon has introduced three further models since, including the 400mm f2.8 late last year, as well as the 600mm f4 and 500mm f4 only recently. The 400mm f2.8 model reviewed here adopts 16 elements in total, with two fluorite and two smaller-diameter elements made from ED glass. With increased use of magnesium alloy in the body and the adoption of large-diameter fluorite elements, the weight savings amount to just under 20%, a not-insignificant amount given the likelihood that professionals may often be required to carry a second telephoto. Common to all four models is the adoption of Nano Crystal coating to reduce flare, stabilization with up to around 4 stops’ correction, and an electromagnetic diaphragm instead of the standard mechanical control system of levers. Although this new aperture mechanism improves exposure consistency, particularly with high-frame rates, it limits compatibility with cameras produced from the D300 onwards. Earlier models, including the D2 series and F series of 35mm film bodies (including the F6), are not compatible. The new model focuses to 1.12’ (0.34m), measures 14.09” x 6.3” (358 x 159.5mm), and weighs a still fairly considerable 8.38 lb (3,800g). It is available now (at a premium of $3,000 over the original model) at around $12,000 (USD). 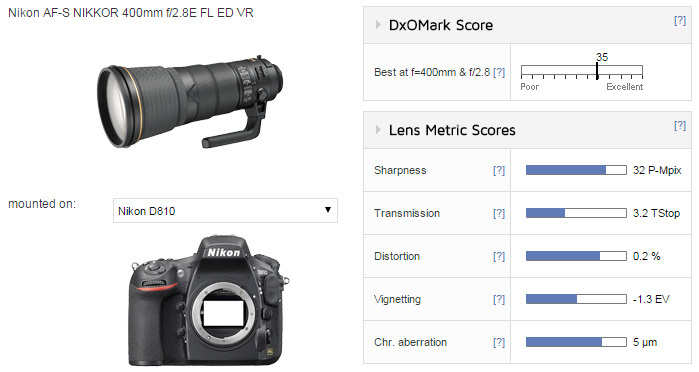 With an overall DxOMark lens score of 35 points on the full-frame 36-Mpix Nikon D810, the new lens is a very high performer overall. At its peak, the lens and sensor are capable of producing images equivalent to around 32-Mpix of data or, to put it another way, achieves close to 90% of the maximum potential of the imaging system. Sharpness is very high, even at the initial aperture, but it’s still necessary to stop the lens down two stops to f/5.6 to achieve peak performance, and to f/8 to reach optimum sharpness across the field. In spite of the fluorite, chromatic aberration, while low, is still around the 5-micron level, and if we’re being very critical, distortion (slight pincushion), transmission and vignetting are all a little higher than expected. The new Nikon has high sharpness at the initial aperture in the center, although slightly less so in the outer field. It is a good result, but we expected slightly better performance. Compared with its predecessor, the highly-regarded AF-S Nikkor 400mm f2.8G ED VR, the new fluorite-based model is very close in performance when taken as a whole, but as one might expect, it does differ slightly. In our tests, the earlier ED model has slightly higher sharpness and better uniformity at the maximum aperture and has slightly higher peak sharpness at its optimum aperture range of f/4-5.6. 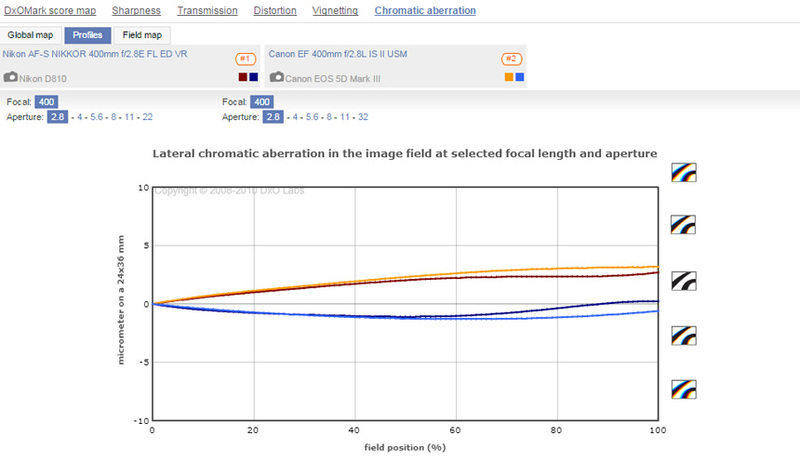 The new lens also trails slightly in transmission and vignetting; however, the difference in lateral chromatic aberration (LCA) measured at just 1 micron at most, and thus is the same for all intents and purposes. In truth, the differences in performance are negligible and aren’t likely to be noticed in real-world use. Although the differences in sharpness are slight, the new model can’t quite match its predecessor until stopped down to f/8 (initial aperture shown above). 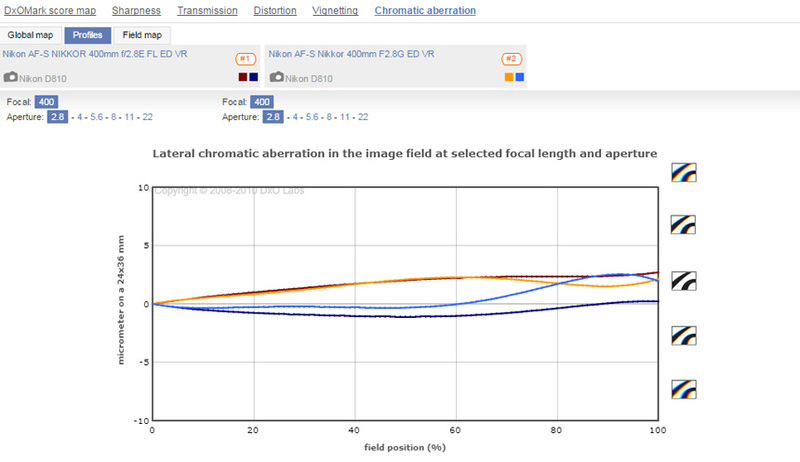 Chromatic aberration is measured at just 1 micrometer more in our metrics score, thus negligible. Both models are very highly-corrected. At around $10,000, rival Canon offers near-identical specifications with its EF 400mm 2.8L IS USM lens. This recently-revamped model is also fluorite-based, and while slightly shorter in length by 0.59” (15mm) due to the lack of the front protective glass, it actually weighs a fraction more than the Nikon at 8.49 lb (3850g). When paired with the 22-Mpix Canon EOS 5D Mk III, however, the new Nikkor performs similarly well when mounted on the 24-Mpix Nikon D610. 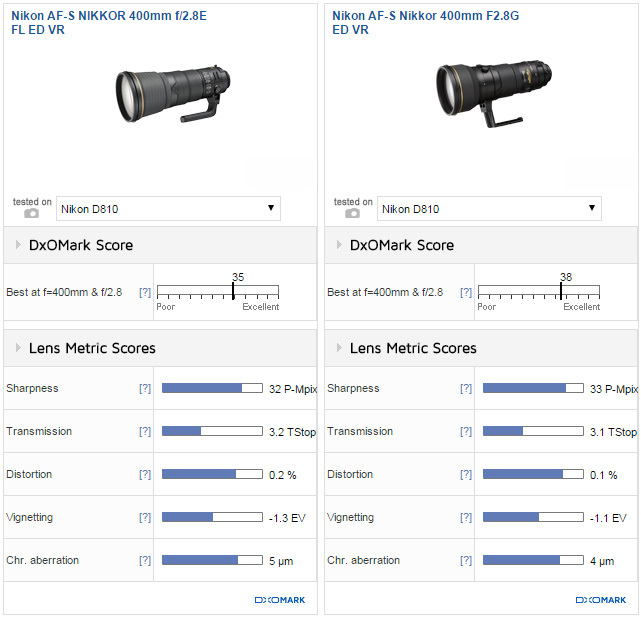 Both models show similar levels of peak sharpness and sharpness levels generally, with the Nikkor perhaps just ahead of the Canon in the centers at f/2.8-4. They even have similar CA profiles, although while the Nikon is marginally better corrected, this wouldn’t be noticeable in real-world use. 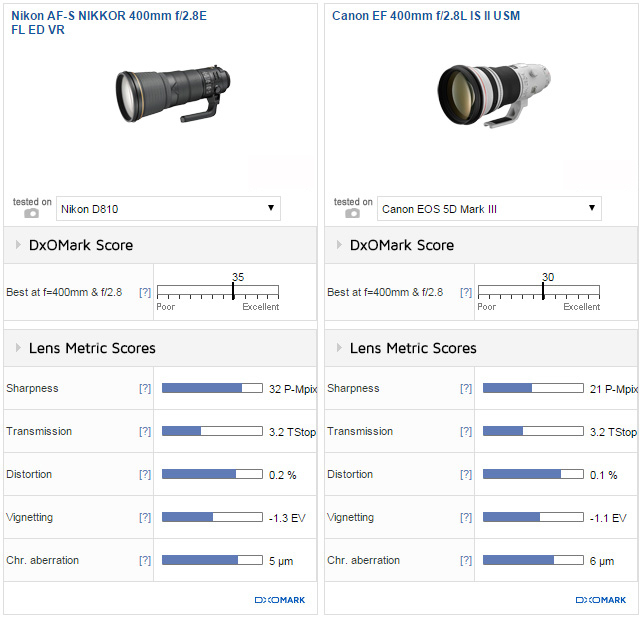 As to the other metrics, the Canon has slightly lower distortion and vignetting, but these two ultra-high-end models couldn’t be closer and overall there’s nothing in terms of performance to choose between. 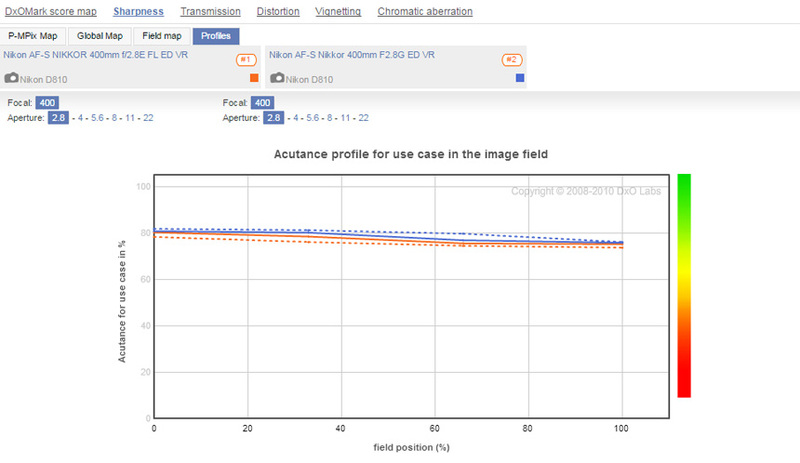 While the Nikon has lower CA, it’s negligible and accounts for a fraction of a pixel at most. Nikon’s decision to switch from over several decades of ED glass in telephoto lenses to that of fluorite is intriguing initially, particularly as the use of fluorite in this type of lens is mostly associated with its archival Canon. 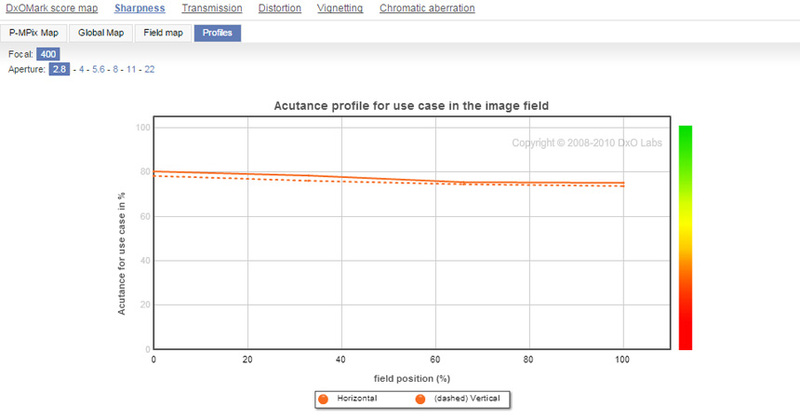 However, as the results reveal, the decision appears to prioritize weight savings while mostly maintaining the optical quality of its predecessor. The new model is lighter overall than the Canon equivalent, yet it retains the meniscus protective lens. That’s a highly attractive feature, potentially protecting that expensive front fluorite element from damage. Whether all that is worth the initial premium over its predecessor (or the Canon offering) is arguable, however, prices are likely to fall over time and few professionals would argue that a lens like this isn’t well worth the investment in the long term.